It is my last day in Hamilton so I put it to good use. 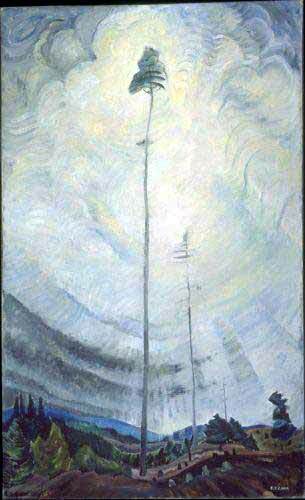 I went to have a look at the Emily Carr Exhibition at the Art Gallery of Hamilton. It is on until October and costs only $10 to go and see it this fee also allows you admission to the rest of the gallery. If you don’t have $10, the gallery also has FREE nights on the first Friday of each month for those readers who have a very tight budget, but still want to see the show. One of my personal favourites, Scorned as Timber, is there. I always hoped to see this one day face to face instead of just in books or on line. I did not know it was there, and when I walked in and saw it, I was stunned. I sat in front of this one for a long while. Truthfully, photos don’t do it justice because you don’t see the movement in it the same. It is breathtakingly lovely! I really liked the experience I had today. I should add that I also particularly enjoyed seeing Zunoqua of the Cat Village. Oddly enough, I never caught the humour in this image until I saw it today. I was also surprised to see that the gallery both rents and sells original contemporary works. I do not know if this is new or if I just failed to notice this before. After seeing the show, I walked over to the Jackson Square Farmer’s Market and purchased some fresh produce to make dinner. I have a few things in my own garden here but not enough to hit all the colour groups. I bought some white eggplant because I thought they might be interesting. Pretty isn’t it? I think Emily Carr would have liked this for dinner even though she was a meat eater. Probably more so if someone else cooked it. She got so sick of people eating up her time on chores when she ran the boarding house “House of All Sorts”. Anyway, as for my dinner, it is in the oven, and I bet you that it looks even better when I finally get it plated. Along with these veggies, I also purchased some fresh whole wheat pasta, grape seed oil, kohlrabi, freshly made pesto and some pine nuts too because I like to have a few whole ones. 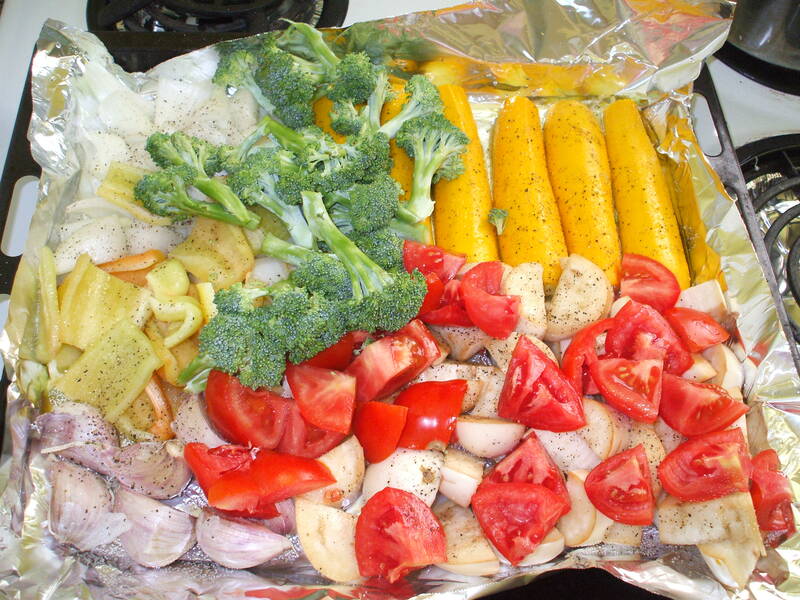 I am cooking all of it and will mix it all (except the kohlrabi) together as one huge roasted vegetable salad. 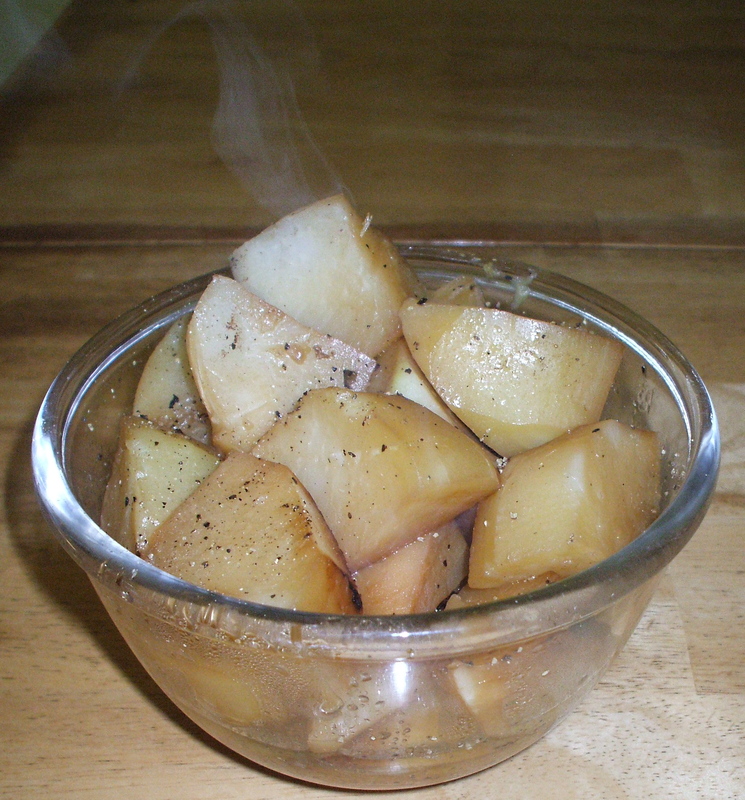 As for the Kholrabi… I boiled it and then burn it a little and reboil to carry the smoke through – add grape-seed oil, good quality wine vinegar, fresh ground pepper and salt. Yum. Don’t worry, I won’t eat this all alone! My husband is still in Kentucky but will return late tonight so we will have a late dinner of nice fresh food. It will be cooled by then too so nice on a long and hot day. Yum, me thinks! Some for dinner – and left overs for the road.